One thing I like about the Fructose Malabsorption diet is that it’s fairly healthy. However, another thing I like is fried chicken. 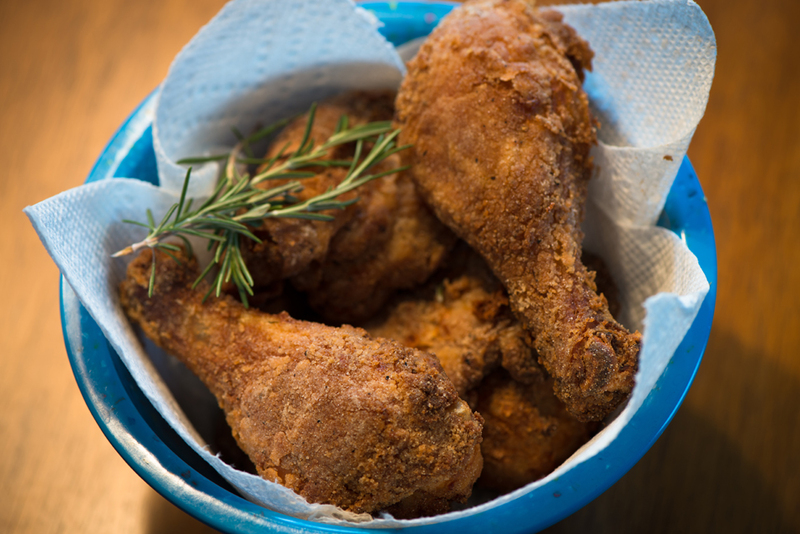 This recipe has been adapted from Martha Stewart’s Rosemary Fried Chicken, and it turned out really well on the first try. This dish is gluten and fructose free, but you can bring it to a summer potluck and no one will be the wiser! Suckers!!! Preheat oven to 450 degrees. Line one baking sheet with aluminum foil and place a wire rack on a second baking sheet (I used one that came with my microwave). In a large bowl, combine chicken, buttermilk, 1 teaspoon of salt, and 1/2 teaspoon of pepper. In another bowl, whisk together the tablespoon of rosemary, flour, 1 tablespoon of salt and 2 teaspoons of pepper. Dredge chicken in flour mixture and transfer to the foil-lined sheet. Dredge them all a second time. In a cast-iron skillet, heat the oil and rosemary sprigs over medium-high heat. When the rosemary begins to sizzle you can take it out and throw it away. In three batches, fry the chicken about 5 minutes on each side (I had to turn the heat up a tad at this point). Transfer the chicken to the wire rack. The original recipe says to put the chicken on two separate rack-topped baking sheets, but I just used one and it still turned out fine. Better than fine. Put the chicken in the oven for about 20 minutes. ***I used a flour mixture from Art of Gluten-Free Baking, and substituted the brown rice flour with gluten-free oat flour to make it fructose free. This entry was posted in Recipes and tagged canola oil, chicken, fried chicken, fructose malabsorption, rosemary by nosugarlessgum. Bookmark the permalink.